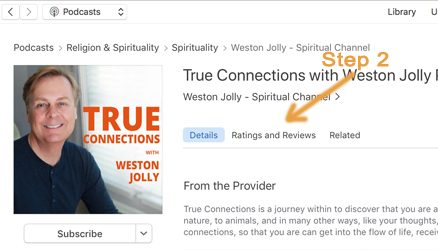 First, let me share my gratitude for your listening to the podcast; True Connections with Weston Jolly®. 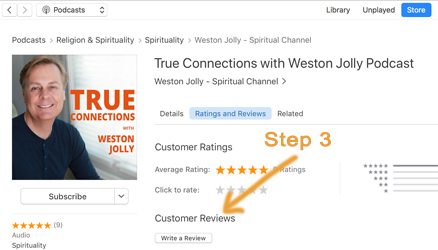 Your comments and review truly assist others in becoming a part of our spiritual community. 2. Tap the Ratings and Reviews tab. 3. Go to the Customer Reviews section and tap Write a Review. 4. Enter your iTunes password to login. 5. Tap the Stars to leave a rating. 6. Enter title text and content to leave a review. 2. Go to the podcast post or the blog post you want to comment on. 3. Go the the bottom of that page and leave your comments and reviews!